Micrographia: Flash Photomicrography: Incident Flash Illumination using Fibre Optic Light Guides. Flash Photomicrography using Acrylic Light Guides. The picture (right) shows a low power incident light setup which uses two separate electronic flash systems. One is used for the incident top-lighting and the other for the background illumination. The top lighting is provided by four acrylic light guides of 1mm diameter which are held close to a xenon flashtube by a row of four brass tubes in a piece of SRBP which replaces the diffuser over the flash reflector. At the other end they are held close to the subject by means of an array of four alligator clips of the kind sold to electronics people to assist in holding small parts for soldering. Short lengths of rubber tubing are used to prevent the clips from damaging the fibres. A Köhler flash lamp of the kind described earlier is seen below the microscope stage to provide the background illumination in the form of Rheinberg illumination using a low power substage condenser and a blue filter as a substage stop. The microscope imaging optics are a Russian x3.5 planachromat fitted with a Davis shutter (small iris diaphragm) to control depth of field within the limits of acceptable resolution, appropriate (orthoscopic) eyepiece, and a Nikon F motor-drive camera and bellows with 125mm focus achromat. The motor-driven Wild 3:1 zoom module shown in the above picture was not strictly necessary, and was used throughout on a zoom setting of 1.0. Closeup showing detail of the arrangement for holding the light guides. 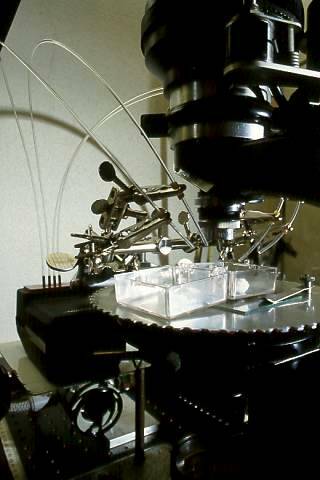 The subject for which the above setup was devised was a tiny (about 1mm) spider, newly hatched from its egg, which had constructed a web across the lower half of the plastic box on the microscope stage. A simple gliding stage arrangement made it possible to follow the movements of the spider using one hand, whilst the other was used to maintain focus. A footswitch fired the camera, to which the two flash units were connected with standard synch. cables. 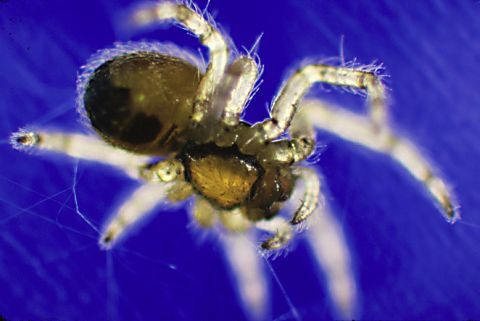 The substage Rheinberg illumination provides the blue background, some edge lighting which catches the hairs on the spider's legs and body, and enough transmitted light to reveal the transparency characteristic of newly hatched spiderlings. The fibre optic incident illumination provides fill-in lighting and highlights which show the shininess of the spider's cuticle. Small spider hanging upside down in its web. The spider is seen energetically adding threads to its web whilst dashing back and forth across it as though on a trampoline. Keeping this little beast in frame and in focus was the major task of the photographic session. To photograph such a fast moving creature at a magnification sufficient to fill the frame would have been impossible without the short exposures enabled by electronic flash. Click to see more spider pictures.